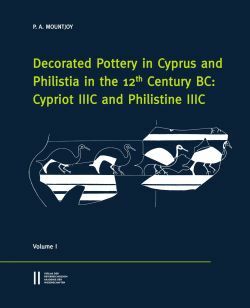 The book comprises a study of the 12th century BC Aegean-style pottery from all the main Cypriot sites together with the contemporary Aegean-style pottery from the three excavated Philistine sites of Ekron, Ashkelon and Ashdod. As part of the project Neutron Activation Analysis of pottery from ten of the Cypriot sites has been carried out in Bonn to obtain the chemical profile of each site, thus enabling movement of pottery round the island to be recorded and contacts between specific Cypriot sites and the Near East to be highlighted. The book presents in full detail the latest information from both excavation and study concerning a key period in the history of the Eastern Mediterranean region. The relevant stratigraphy at each site is discussed and documented with plans and sections, and the pottery comprehensively illustrated with line drawings. Unlimited access, courtesy of the excavators, to the contemporary Aegean-style pottery from the three Philistine sites adds another dimension to the study. Much of the material is new. Both new and old material is presented in a rational and organised fashion which will facilitate its use. It comprises unique material which has frequently been erroneously cited in support of the various theories put forward for the collapse of the Bronze Age cultures of the region. This comprehensive exposition of the evidence in a clear and rational format will form the foundation for real progress in our understanding of this complex and intriguing period. The book is an essential source volume for those working in the region.